Strathmore’s “Paper Is Part of the Picture” campaign took a new turn in March 1922 with the announcement of The Strathmore Collection, a new series of mailers designed by “leading exponents of the graphic arts,” replacing the uncredited artists used until that point. It can be assumed that the change was spurred by the Federal Advertising Agency since they handled the artists. The first mailer (using Strathmore Tangleweave) was designed by Guido and Lawrence Rosa. It took the form of a booklet (subtitled “A Venture into Everyday Psychology”) with a fold-out poster inside (in which the cavaliers in the advertisement—see below—were hailing a galleon across the paper sea). “Paper is the great undiscovered,” the text declared. “The world is forever calling it ‘book’ or ‘booklet,’ overlooking the obvious fact that it is Paper. This failure of Paper to speak for itself is due to no lack of eloquence, but to an incorrigible habit of speaking for the user.” Strathmore’s copywriters were becoming more eloquent in their arguments on behalf of paper as a part of the picture. 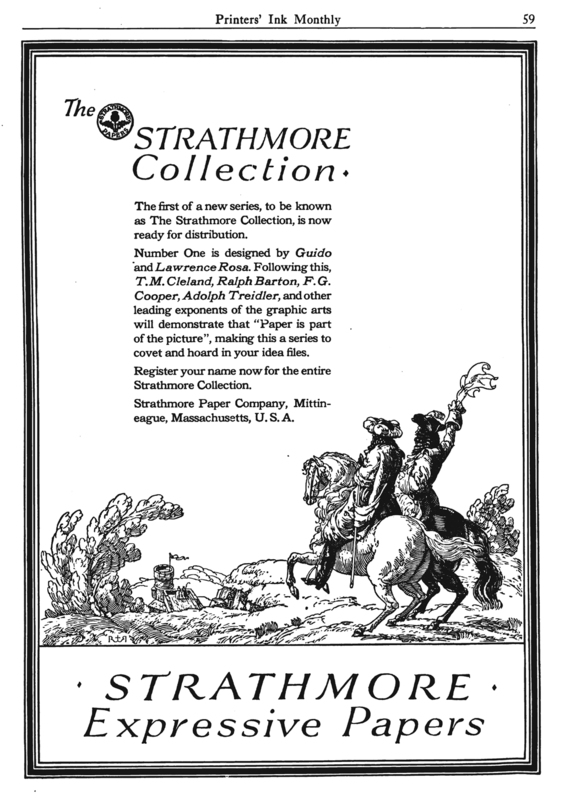 “The Strathmore Collection” advertisement in Printers’ Ink Monthly vol. 4, no. 4 (March 1922). Design by Guido and Lawrence Rosa. The Rosa Brothers mailer was followed monthly by ones by Adolph Treidler (April), Ralph Barton (May), and F.G. Cooper (June). Each mailer was different. Those by Treidler (using Strathmore Rhododendron) and Cooper (using Strathmore Baypath Cover) took the form of a brochure that opened up into a large poster, while Barton (using Strathmore De Luxe) created a small booklet. With the Treidler mailer The Strathmore Collection was renamed The Strathmore Artists’ Series to further emphasize the celebrity of the artist/designers the company had hired. Strathmore’s decision to commission “leaders in the Graphic Arts” paid off immediately as the nascent Art Directors Club selected the mailers by the Rosa Brothers, Treidler and Cooper for its Second Annual Illustrations for Advertisements exhibition. Treidler’s mailer showcased his talents as a woodcut artist as a means of demonstrating “paper as color”. 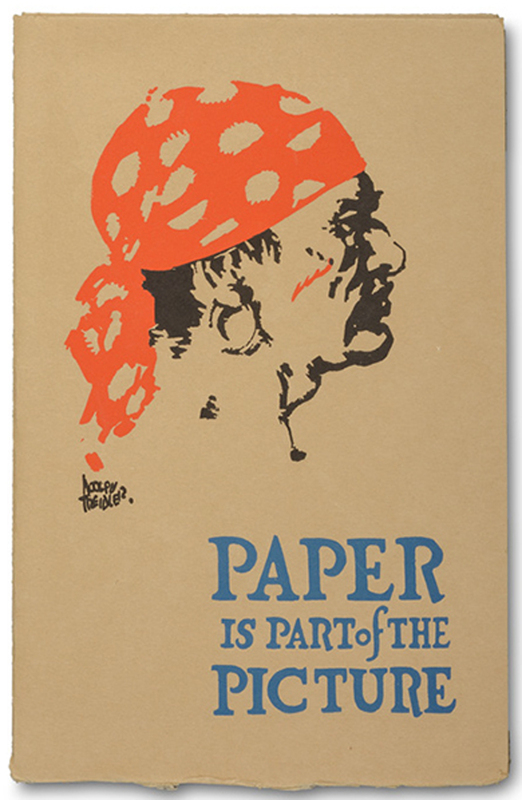 A portrait of a pirate was on the envelope and the first panel of the folded poster. But the full poster (25 x 9 1/2 inches), once opened up, had nothing to do with piracy. Instead, the multi-color illustration was of a farmer with horse and plough in a field. It was the most dramatic and eye-catching of the first four mailers—the images posted here do not do justice to the physical mailer was perceived by a recipient. First panel of Paper Is Part of the Picture mailer (Strathmore Paper Co., 1922). Design by Adolph Treidler. Photograph by Vincent Giordano. 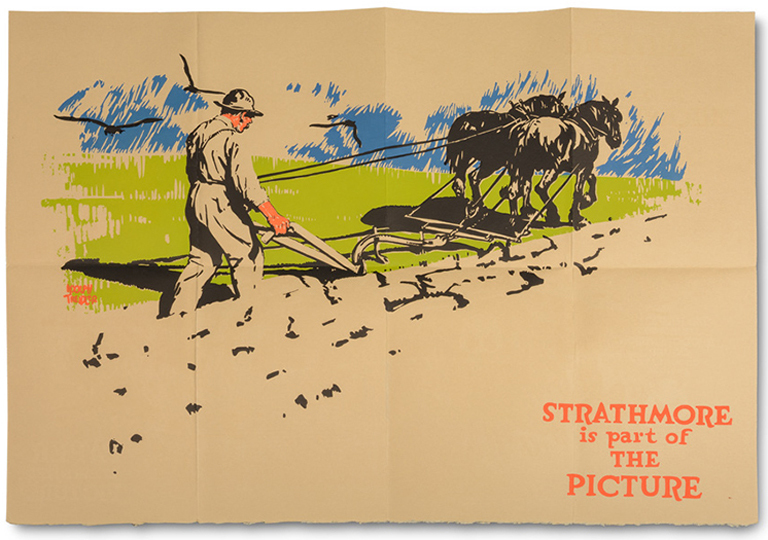 “Strathmore is part of the Picture” poster (Paper Is Part of the Picture opened up) (Strathmore Paper Co., 1922). Design by Adolph Treidler. Photograph by Vincent Giordano. Discovered! ¶ Curious, isn’t it? This long business of adventuring, exploring, forever searching for new and more impressive effects in printed matter, only to discover them at last, in so simple a fact as this: Paper is part of the picture. Fold up this paper again and look at it as so much ocean. This is not the painted sea of the Ancient Mariner, but some waves by F.G. Cooper. The rest is Strathmore. Mr. Cooper hasn’t used the purplest purple, nor the greenest green, nor the grayest gray for his illustrations. He has preferred to use colors of mild chroma to make the most of the warm grayness of the paper—inviting the paper to become part of the picture. This was an unstated reference to the lessons of A Grammar of Color (see Paper Is Part of the Picture no. 12). Discovered! 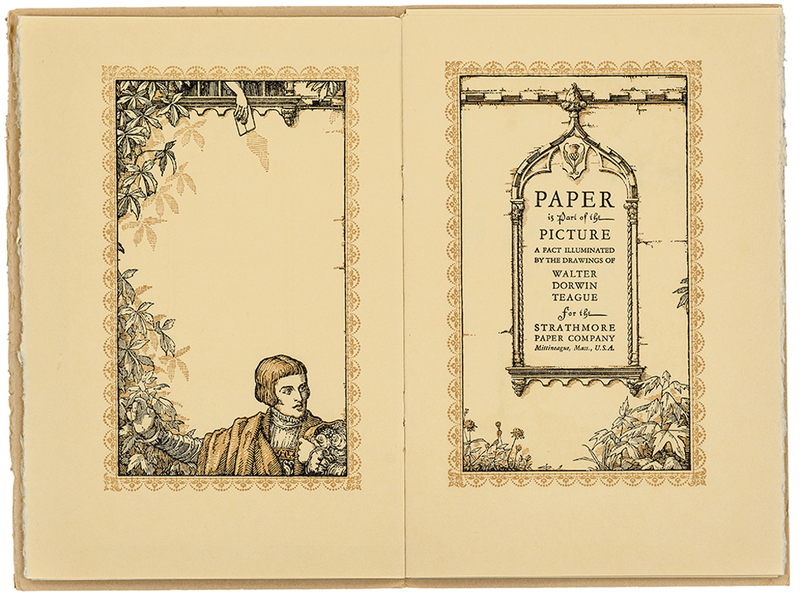 Paper Is Part of the Picture opened up (Strathmore Paper Co., 1922). Design by Fred G. Cooper. In comparison to the others, Barton’s mailer was understated. It was a simple folder in an envelope that showed off several fashion “sketches” of his. The cover is shown at the top of this post. 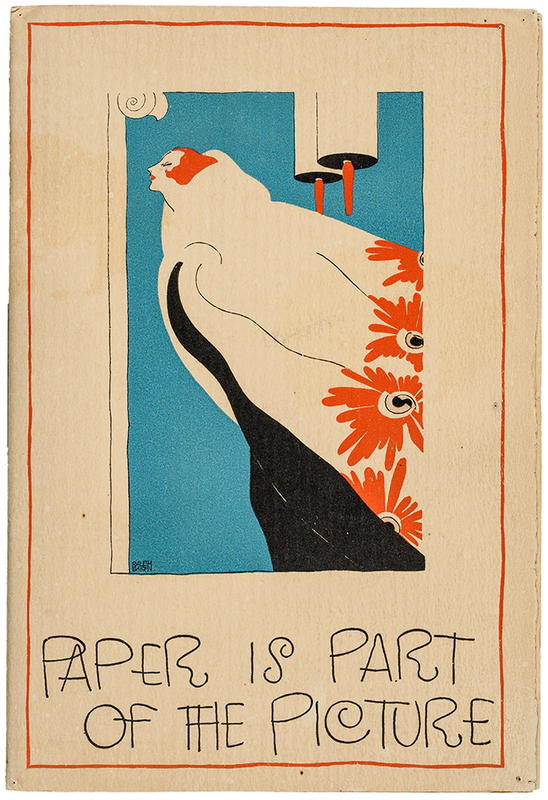 Paper is part of the Picture mailer (Strathmore Paper Co., 1922). Design by C.B. Falls. The positive reception accorded The Strathmore Artists’ Series by the paper and printing trade press encouraged Strathmore to continue the campaign with a second series in the fall of 1922. The new line-up of artists, announced in a September advertisement, consisted of C.B. Falls (using Bannockburn Cover), Walter Dorwin Teague (with Rhododendron Cover and Alexandra Japan), and T.M. Cleland (using Old Stratford Parchment Cover). 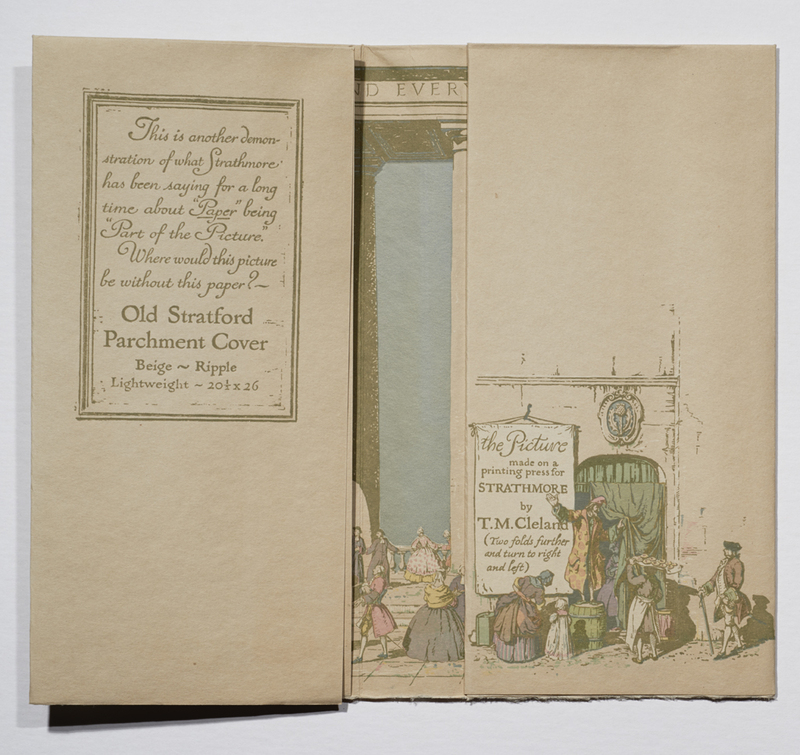 Both Falls and Teague created booklets like Barton’s while Cleland—whose mailer was not sent out until January 1923—produced a brochure that opened up in as exciting a manner as Cooper’s. Right here and now a gentleman in the audience rises to inquire about the cost. There is always a gentleman, usually in a back seat, rising to inquire about the cost. To him we reply that of course, Quality costs more. The pertinent inquiry is: “Does it pay more?” The question really amounts to asking yourself whether or not your booklet would be more influential if it were a better booklet, better printed on better paper. 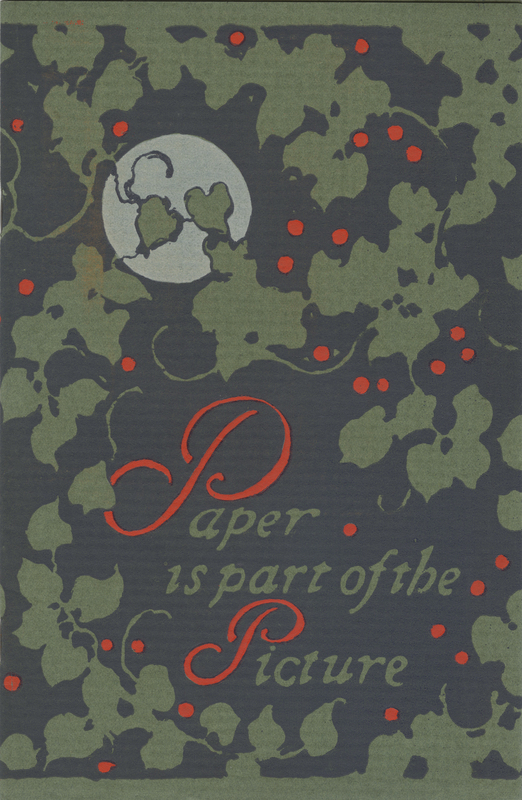 Paper Is Part of the Picture title page spread (Strathmore Paper Co., 1922). Design by Walter Dorwin Teague. Photograph by Vincent Giordano. Cleland’s contribution to the “Paper Is Part of the Picture” campaign is witty. The front of the closed mailer appears to be a building wall with the Strathmore thistle and the words “Paper is part of—” on it. Two 18th-century gentlemen, a woman with her young daughter in tow, and a dog are all gathered in front of the phrase with the gentleman on the right pointing to the phrase with his walking stick. The rest of the phrase is not visible until the recipient opens the folder. It then appears on the right as part of a hanging banner: “the Picture made on a printing press for Strathmore by T.M. Cleland (Two folds further and turn to the right and left). Another small crowd is assembled to watch a man standing on a barrel who is gesturing to the banner. Front of mailer Paper Is Part of the Picture (Strathmore Paper Co., 1922). Design by T.M. Cleland. Photograph by Annie Schlechter. 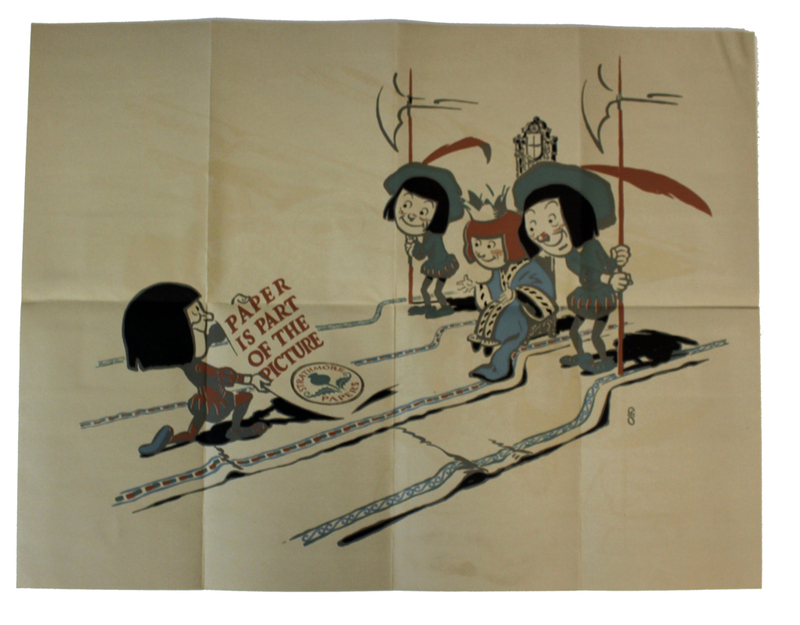 Partial opening of Paper Is Part of the Picture mailer (Strathmore Paper Co., 1922). Design by T.M. Cleland. Photograph by Annie Schlechter. 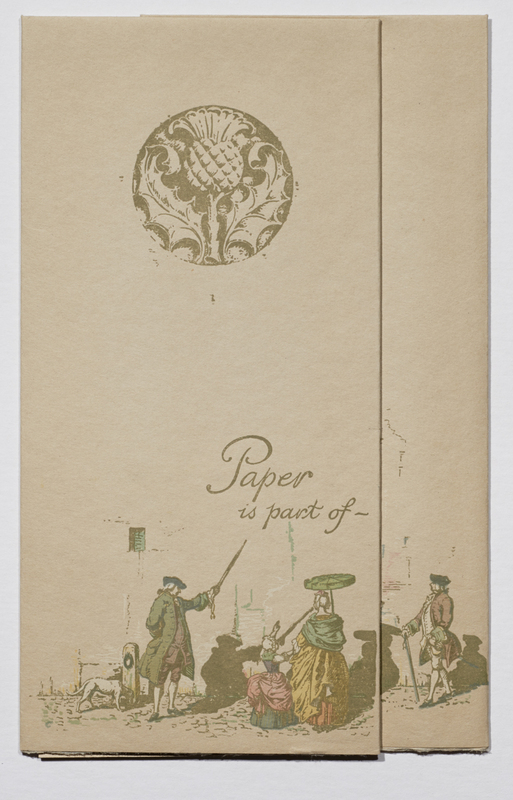 Paper Is Part of the Picture mailer fully opened (Strathmore Paper Co., 1922). Design by T.M. Cleland. Photograph by Annie Schlechter. Cleland’s mailer provided a sophisticated counterpart to Cooper’s broad humor. It was a fitting conclusion to the first year of The Strathmore Artists’ Series. Not only had Strathmore discovered a durable slogan, but it had found an attractive and memorable means to illustrate it. Finally, after eight years of stumbling around the notion that paper has an expressive quality, the papermaker had figured out how to fully prove that to printers and their customers.